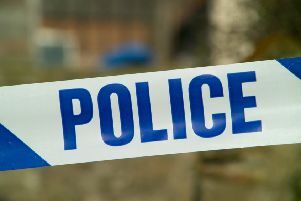 A man brandishing a hammer has stolen a three-figure sum from a bookmakers in West Lothian. The armed robbery happened around 8.25pm yesterday, Wednesday, March 27, when a man entered the William Hill Bookmakers on Uphall Station Road in Pumpherston. He demanded a female member of staff hand over a quantity of cash, before running off with it. He was last seen walking on Uphall Station Road outside the shop. The staff member was not injured as a result of the incident. The man was white, slim, around 5ft 10in tall and spoke with a local accent. He was wearing a black jacket with the hood up, a black scarf, navy tracksuit trousers, white trainers and black gloves. He was also carrying a white carrier bag. Detective Chief Inspector Paul Batten, of Lothians and Scottish Borders Criminal Investigation Department, said: “Thankfully no one was hurt during this incident, but the staff member has been left badly shaken. “We are currently pursuing a number of lines of inquiry to trace the man responsible. Be assured that we will use all resources at our disposal during this investigation, however we do need the public’s assistance. Those with information are asked to contact Police Scotland on 101, quoting incident number 3857 of March 27, or anonymous via Crimestoppers on 0800 555 111.